Phablet is a hybrid of a smartphone and a tablet. The goal of the industry is to offer a device that has the portability and functionality of a smartphone, and the tablet size screen experience. Customers that are looking for better performances of their devices, larger displays, and better cameras on their devices often turn to phablets. 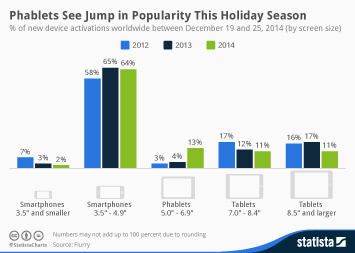 The screen size of a phablet varies between five and 6.9 inches. According to a 2017 Statista survey, almost 70 percent of U.S. consumers held a positive attitude towards the trend of ever larger smartphone displays. This favorable consumer attitude towards phablets was echoed by market forecast for phablet shipments, which foretells decreasing shipments for small-screen smartphones and increasing trajectory for large-screen smartphone shipments. It is projected that by 2022, smartphones with screen size larger than 5.5 inches are going to take up more than half of the overall smartphone market. Contrary to the increasing shipment trajectory, the average selling price (ASP) of phablets is forecasted - to the liking of consumers - to take on a downward road, decreasing from 419 U.S. dollars in 2015 to 304 dollars in 2020.